Kenneth A. Hendrickson went to be with the Lord, June 14, 2015. 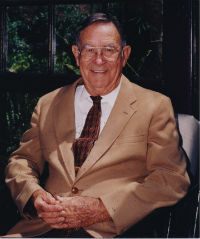 He was born on January 3, 1921 in Bolivar, Missouri to Mr. and Mrs. Wren P. Hendrickson; the youngest of seven children. Kenneth’s parents moved their family to Santa Barbara when he was seven, where he lived the remainder of his life. Kenneth was an employee of Southern Counties Gas Company, now Sempre Energy, for thirty-five years. Kenneth was very community minded. He was elected to the Isla Vista Sanitary District, now Goleta West Sanitary District. He was elected for forty five years as a representative of the District. Kenneth married Marceline Day on February 4, 1950 and they had five children, Kenneth W. Hendrickson, Karen Thomsen, Kathy Eyman, David Hendrickson, and Paul Hendrickson. They also have six grandchildren, Sarah James, Robbie Eyman, Lisa Thomsen, Stephen Thomsen, Matthew Eyman, and Miranda Hendrickson, and two great grand children: Benjamin Thomsen, and Joella Eyman and another great grand child that will be born November 2015. He is also survived by his two nieces, Jill McMillan, and Shirley Ludwig; one nephew, Gordon Hendrickson, and numerous great nieces and nephews. Kenneth was a member of the “Greatest Generation”, serving three years in the upper Assam River Valley, India, during World War II in the US Army Air Corps. A memorial mass will be held Saturday, June 27, 2015 at Saint Anthony’s Chapel, Garden Street Academy, 2300 Garden Street, Santa Barbara at 10am.